Williamstown, Kentucky, July 5, 2018– Two years ago this week, the Ark Encounter opened its doors and quickly became a major international tourist destination. Answers in Genesis (AiG), operators of the Ark Encounter, continues to engage in major expansions this year and through 2019, with other significant additions planned beyond 2019. Meanwhile, new hotels and other tourism-related businesses have launched or are under construction throughout Northern Kentucky, and their owners cite excellent attendance at the life-size Noah’s Ark as a main reason. As this world-class Christian themed attraction wraps up its second year tomorrow, tourism officials are testifying to the ark’s remarkable economic impact on the region. In addition, the state’s treasury is benefiting, and Kentucky is also seeing the creation of thousands of ark-related jobs. As the Noah’s Ark replica sails into its third year of operation, additions and projects are underway at the theme park that will have fans returning again and again as the Ark Encounter theme park expands. · A large 2,500-seat auditorium inside a multi-purpose facility called the Answers Center will open later this year near the ark. The center will include a 36,000-square-foot basement with classrooms and breakout areas. 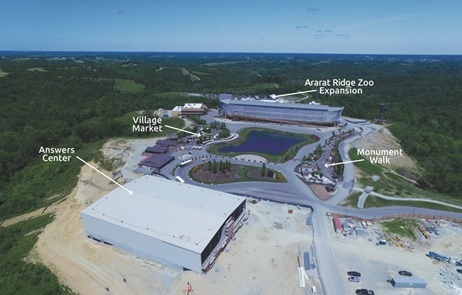 · The impressive Ararat Ridge Zoo behind the ark is doubling in size, to be completed by the summer of 2019. Tibetan yaks, zebras, alpacas, kangaroos, and many other animals have been added since the Ark Encounter opened. · A large new children’s play area is being planned for a spring 2019 opening. · Village Market on the west side of the lake features new food venues and one-of-a-kind retail items for sale, including Fair Trade products. Featured in this village is Oscar’s Store, with unique hand-painted items. · The new Monument Walk entrance to the ark, now open on the east side of the lake, is an instructive area where guests are introduced to major biblical events of Genesis prior to Noah’s Flood. Exotic live birds are also exhibited. · The beautiful Rainbow Gardens are a must-see for guests as they walk to the Ararat Ridge Zoo. In one spot, flowers help recreate the rainbow of Genesis chapter 9 for visitors to view as they sit in covered eating areas. · The huge Emzara’s Buffet restaurant, with 1,500 seats, now features an expanded buffet with many new menu items, drawing raves from guests. As the Ark Encounter enters its third year in Williamstown and expands, 2018-2019 is already shaping up to be another excellent year of attendance and economic impact. Answers in Genesis is an apologetics (i.e., Bible-defending) ministry based in northern Kentucky, near Cincinnati. In 2016, AiG opened the Ark Encounter, with a massive Noah’s Ark as its centerpiece, drawing up to 8,000 guests a day. The Creation Museum (west of the Cincinnati Airport) has welcomed 3.6 million visitors and has also become a major family attraction in the Midwest. For more information, visit www.answersingenesis.org.